Υποβλήθηκε από seo στις 11.02.2019 - 13:39. Drum roll, please...and the answer is — It depends on the situation, the exact keywords, and the intent of the user when searching for a particular term. In the instances where both pages have really high rankings on the first page of the SERPS, this could work in your advantage: More space occupied means more traffic for your pages, so treat it as "good" cannibalisation. Review your title tags, headings, and page copies and try to find instances where both pages seem to overlap. If the degree of duplication between them is really high, it might be worth consolidating/canonicalising/redirecting one to the other (I'll touch on this below). If the flip-flop has occurred only once and seems to have stopped, there is probably nothing to worry about, as it's likely a one-off volatility in the SERP. At the end of the day, we need to remember that Google runs test and changes almost everyday. One caveat of these kinds of ranking tools is that this data is often accessible only by keyword and will require data analysis. This means it may take a bit of time to check all keywords involved in this cannibalisation, but the insights you'll glean are well worth the effort. If you're looking for a speedier approach, you can build a Google Data Studio dashboard that connects to your GSC to provide data in real time, so you don’t have to check on your reports when you think there is a cannibalisation issue (credit to my colleague Dom). 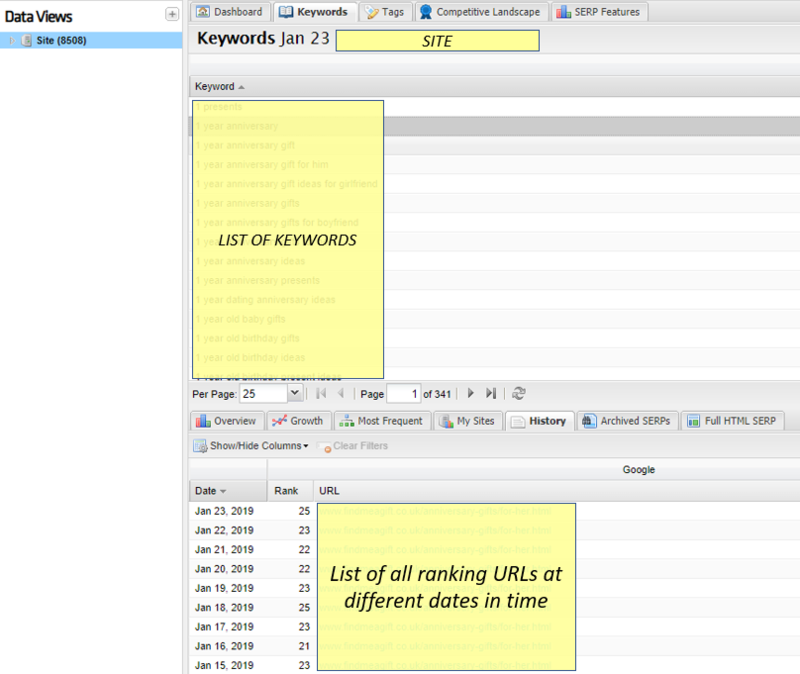 The table above captures the full list of keyword offenders for the period of time selected. For instance, keyword 'X' at the top of the table has generated 13 organic clicks (total_clicks) from GSC over the period considered and changed ranking URL approximately 24 times (num_of_pages). Let's say you created a new article that covers a similar topic to another existing one (but has a different angle) and you find out that both pages are cannibalising each other. After a quick analysis, you may decide you want Page B to be your "primary", so you can use a canonical tag from page A pointing to page B. You would want to use canonicalisation if the content of the two pages is diverse enough that users should see it but not so much that search engines should think it's different. The SERP on the left shows a SERP for a query of "shoes gift ideas". It displays a row of pictures from Google Images with the link to see more, one editorial page (informational content), and then the rest of results are all transactional/e-commerce pages for me to buy from. Google has assumed that I’d like to see commercial pages as I might be close to a conversion. 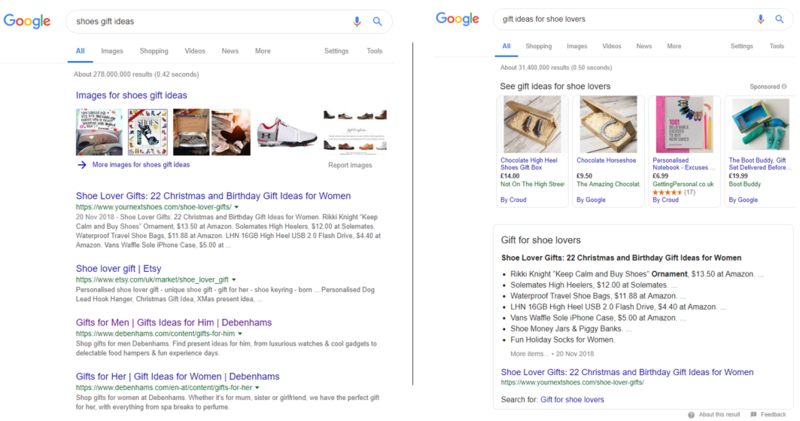 The SERP on the right shows a SERP for a query of "gift ideas for show loves", displaying a row of Google Shopping ads and then a featured snippet, taken from an editorial page, while the rest are a mix of transactional and editorial pages, with Pinterest ranking twice in the top 10. Clearly Google is not sure what I would prefer to see here. Am I still in the consideration phase or am I moving to conversion?